My brain is still buzzing. I feel so honored and lucky to have been given this amazing award. 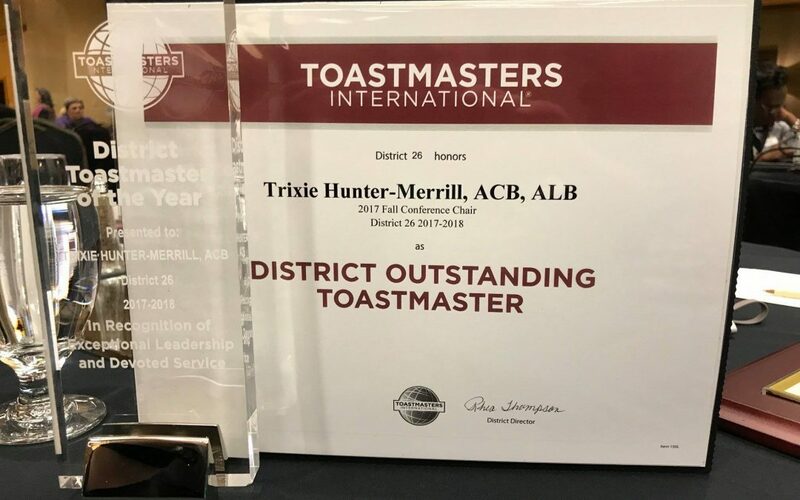 After only two years in Toastmasters, and after overcoming all in my life with all my hardships even before Toastmasters, to think that I would EVER receive such an honor as Toastmaster of the Year — I could never possibly have imagined. 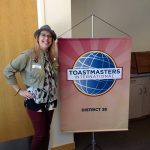 When I first joined Eloquent Entrepreneurs Toastmasters in October 2016, I had no idea that two weeks later I would be diagnosed with colon cancer. The next two years were constant surgeries, chemotherapy, horrible cases of unusual side effects, plus frequent hospitalization. 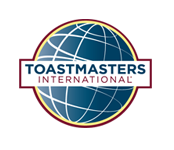 My Toastmasters were there for me — no matter what! From taking me to appointments, to cleaning my kitchen, to bringing me food and many times, visiting me in the hospital, I saw the love they had for me, even though they hardly knew me. While I was not always able to participate, they took whatever I could give them and gave it back tenfold. Late September 2017 I was pronounced in remission, though still was dealing with some crazy side effects, I became the Social Media Chair for the District. With my Web and Social Media Strategist experience I was happy to help out. I went on to be the Fall Conference Chair earning my High Performance Leadership, was Social Media and Silent Auction Chair for the spring conference, and desired to help us rebuild a new District 26 website with Source One Technologies and an amazing web team consisting of Tom Marrs, Rhea Thompson and Greg Harris. I am happy to say in 2018, I have completed one full year of remission and am feeling better than ever!